This video covers everything a patient needs to know to get started with AcceleDent® Optima™, including the components of the system, instructions for use and care, as well as an overview of the AcceleDent App. 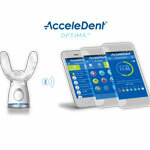 AcceleDent Optima is the first & only orthodontic device that directly connects patients and practices. Request an in-office AcceleDent demonstration or product information today.